Our team has spent months testing a great number of wireless indoor security cameras, and finally summarized the following top 4 picks for your choice. No matter what kind of WiFi security cameras for indoor use you want, hidden or obvious, battery powered or traditional wireless types, you can get the best one for your living room, bedroom, apartment condo, car, backyard, weekend house, warehouse, garage, office, farm, etc. here. Those wireless indoor security cameras with PTZ function enable you to monitor a wide range of your property with just a standalone security camera, so you don’t have to buy multiple fixed IP cameras to cover the whole area of your property (saves your budget!). You will get the smart features and videos of top 3 wireless home CCTV security cameras. All of them are super easy to install, and available as standalone devices with free monitoring software. No subscription charges or monthly fees (with free shipping)! 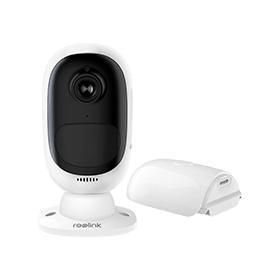 Reolink Argus® 2 WiFi indoor & outdoor security camera features its 100% wire free, offers stunning 1080p videos & exceptional starlight night vision, and provides an SD card slot for motion detection recording. You can place this camera anywhere you like, even for your property without power cords and WiFi connection. This wireless indoor security camera uses rechargeable battery and can be connected to the solar panel to get non-stop power supply. Reolink Argus® 2 can work totally standalone without connecting to a central hub (such as the base). All of these smart and outstanding features make Reolink Argus® 2 one of the top rated wireless security cameras for both indoor and outdoor use. You can check the below chart to get more exceptional features of Reolink Argus® 2 wireless hidden indoor & outdoor security camera. You can check the below video to see how a top tech YouTuber reviews this wireless indoor security camera. 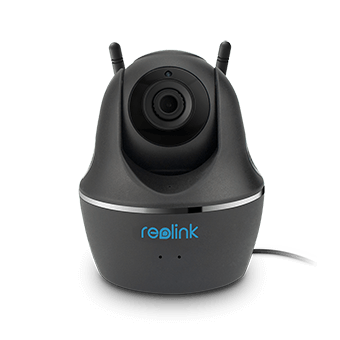 Reolink C1 Pro WiFi indoor surveillance camera is small in size but big in features, performance and value. It captures 1440p Super HD images that are much clearer and sharper than 1080p counterparts. This wireless home indoor security camera comes with a micro SD card slot offering you local storage without paying monthly fees for cloud storage. With the powerful pan tilt function, you can simply open the app or the client and use the on-screen button to tilt the camera up and down, left to right. Reolink C1 Pro is rated as the “Best Value Pan Tilt Camera” in VueVille’s “Best Indoor IP Camera Recommendation List 2018”. You can check the below chart to view more smart features of this wireless indoor IP camera. You can watch the cute video “Naught Pet Caught in the Act” captured by Reolink C1 Pro (shared by a customer). RLC-422W wireless indoor & outdoor CCTV surveillance camera combines almost every smart feature in just a single IP camera. You can get crystal-clear images and videos with its exceptional 5MP resolution. As world’s first dual-band WiFi outdoor and indoor security camera, you can switch between 2 WiFi band options based on the WiFi speed. This wireless indoor & outdoor surveillance IP camera works well with Reolink NVR, which enables you to get continuous recording and 24/7 surveillance. If you prefer an all-in-one wireless indoor security camera system, you can add an NVR to this camera. You can watch the below clear video captured by RLC-422W dual-band WiFi indoor & outdoor security camera (shared by a customer). After you’ve got the best wireless indoor security cameras, the next step is to install them. You can get some installation ideas below. The installation process of wireless indoor security cameras is much easier than the outdoor mounting. Battery powered wireless indoor security cameras: You can simply install this type of battery powered security cameras by inserting the batteries into them. There is totally no installation. You can set it up by following the quick start guide or user manual to get the necessary settings done, such as motion detection, scheduled recording, etc. You can place this camera in your baby’s room, in your kitchen, garage, etc. anywhere you like. With the wire-free feature, you don’t need to worry about the messy wires ruining your perfect décor. You can take a look at the below video to see how easily it can be to install a battery operated wireless indoor security camera. Traditional wireless indoor security cameras: You can install this type of wireless indoor security cameras by plugging them in. If you need to mount the camera to the wall, you’ll need several screws to make it stick to the wall. Please avoid installing the camera in a place where your children can reach it. If your children touch the outlet, they are in a risk of getting electric shocks. Some advanced traditional wireless security cameras can automatically connect to your home router after powering them on, (like Reolink WiFi security cameras), which can free you from messy settings to access the camera. 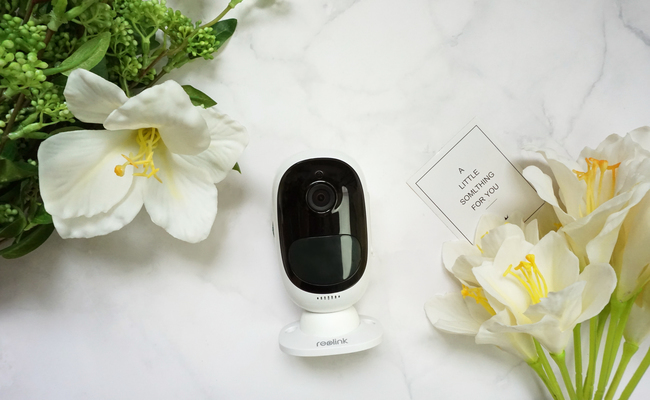 You can read this post (written by Amanda, the Reolink experienced tech editor) that offers all the details on installing security cameras step by step. We came across many questions about wireless security cameras when wandering on forums, so we decided to write detailed answers to these hottest questions. If you have other questions, please add them in the comment below! Traditional wireless security cameras need to be plugged in for the power supply. Some advanced wireless security cameras are battery or solar powered, making the cameras truly wireless from the top to the bottom. Most wireless security cameras are either 2.4 GHz or 5 GHz. Some advanced security camera companies, like Reolink, adopt dual-band WiFi technology on the cameras, offering you more WiFi band options. Wireless security cameras that need to be plugged in — this type of security cameras needs to be plugged into the outlet to get the power supply. Wireless security cameras that are battery-powered — this type of security cameras uses rechargeable or non-rechargeable batteries to get power, making the cameras totally wire-free. However, the battery life would be your big concern. You can get some tips here to maximize the security camera battery life. WiFi security cameras that are solar-powered — typically you will need a solar panel to collect the energy to provide the power supply for the wireless security cameras, a solar charge controller to prevent the overcharge, and rechargeable batteries to store the solar energy. Also, the connection cables between the solar panels and the cameras are needed. Wireless security camera setup is extremely easy. You can simply plug the camera in, and then configure the cameras with the client software or app installed on your computer, Mac, mobile phones. All is done! If you need to set up the wireless security cameras for remote viewing, there are 2 solutions. 1. Use the security camera manufacturer’s customized client or app. You can access the wireless security cameras via the UID thanks to the P2P technology. 2. Adopt port forwarding for remote viewing. You can read this post to get a step-by-step guide to set up your wireless security cameras for remote viewing. The post is written by Jenny, the Reolink senior editor, who has been in home security field for over 10 years. You still can get video surveillance even without WiFi. 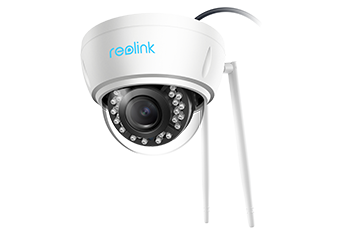 Take Reolink wireless security camera system as an example. 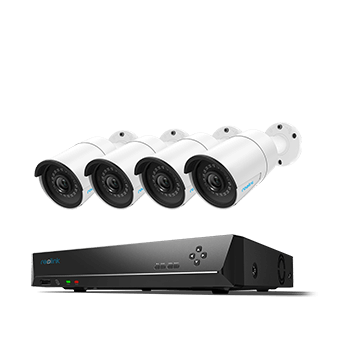 The wireless security cameras and the recording NVR can automatically connect with each other with their proprietary network. Stay Protected with Security Camera Systems; 24/7 Video Recording and Monitoring; 2 Network Solutions – with or without network. You can get 24/7 monitoring even without WiFi. You can play back the recorded videos to see what was going on. This security camera system is ideal for your barn, farm, or other remote areas without Internet access. The WiFi range of wireless security cameras varies among security camera brands. Digital wireless security cameras would have a WiFi range between 250ft to 450ft (in open areas). For example, Reolink RLC-422W wireless security camera, with its 2T2R MIMO antennas, can offer you even 250ft long distance, which is quite outstanding in the market. The WiFi signal or range can be influenced by the physical barriers, such as the building materials. Your wireless security cameras may suffer from WiFi interference by other wireless devices, such as your mobile phones, microwave ovens, etc. You can try the helpful tips in this post to solve the wireless security camera WiFi interference. The battery life of wireless security cameras may vary based on the settings, environmental conditions and other factors. In most cases, the battery life can last for several months. Some security camera companies claim that the batteries can support up to 1 year or even 2 years. Unfortunately, it’s not true. Sometimes, the batteries will drain within several weeks. So avoid buying those security camera brands that are exaggerated. You can take a look at Reolink Argus® 2 battery-operated security camera. With the advanced power-saving technology, the camera can last up to 180 days in standby mode. When you buy a battery powered wireless security camera, remember to check the reviews of the previous customers to see how long the battery life can last. If you have any questions, shoot me in the comment below. Let’s work them out together! This entry was posted in Buyer's Guide and tagged Wireless Indoor Security Cameras. Informative blog. These type of blogs give the accurate information about particular thing. Wireless security cameras are best now days. I’m looking Select Security Systems Ltd. for getting it install in my premises. Hi Larry, thank you for your comment! If you have any ideas about wireless indoor security cameras, please share with us! Nice article, Wireless Indoor security cameras are very essential for our home security. We can save our life with the help of this device.There are many options for buying Indoor security cameras but in my points of https://www.titathink.com/ is best. A few days ago I had bought it from this shop at a very suitable price. If I will need it in future then I will definitely buy from you. Hello Adelia, glad that you like this post. If you have any ideas about wireless indoor security cameras, please share with us in the comment!